Another “Humanitarian” flotilla on its way to Gaza while Damascus is dying . Sounds less like humanitarianism and more like politics & hypocrisy. Remember the 2010 Gaza Flotilla? Who doesn’t. the so-called humanitarian event, which resulted in violence and casualties, has been a turning point of escalation in the region. And apparently- One painful failure wasn’t enough for kind people to know better, because rumor is that another flotilla from Europe to the coast of Gaza is being planned. Humanitarian flotillas make for great media stages. Specially if the country you are sending the flotilla to decides to defend itself. It is a PR event destined to get people to notice to the pleas of the downtrodden. The organizers claim that the flotilla is humanitarian, a non-political act of kindness and outreach to benefit the Palestinian population. They are not against Israel, they claim, but simply for the people of Gaza who are in true need. It has been known for over a year now that Damascus and the Syrian people is in the most urgent need for humanitarian aid in the Middle East. The actual numbers (updated for August 31st, and on a steep rise since) speak for themselves- And can be seen in the Infographic I made. In case this really isn’t a political flotilla, I believe these human-loving “activists” – Who read the news like any of us- would have travelled north as well towards bleeding Syria and offer help to those in desperate need up there. But it turns out this is not the plan. Instead, they are going to wave Palestinian flags, confront the IDF and create a provocation in front Gaza coast. Not a single word about Syria. So I made this Image. 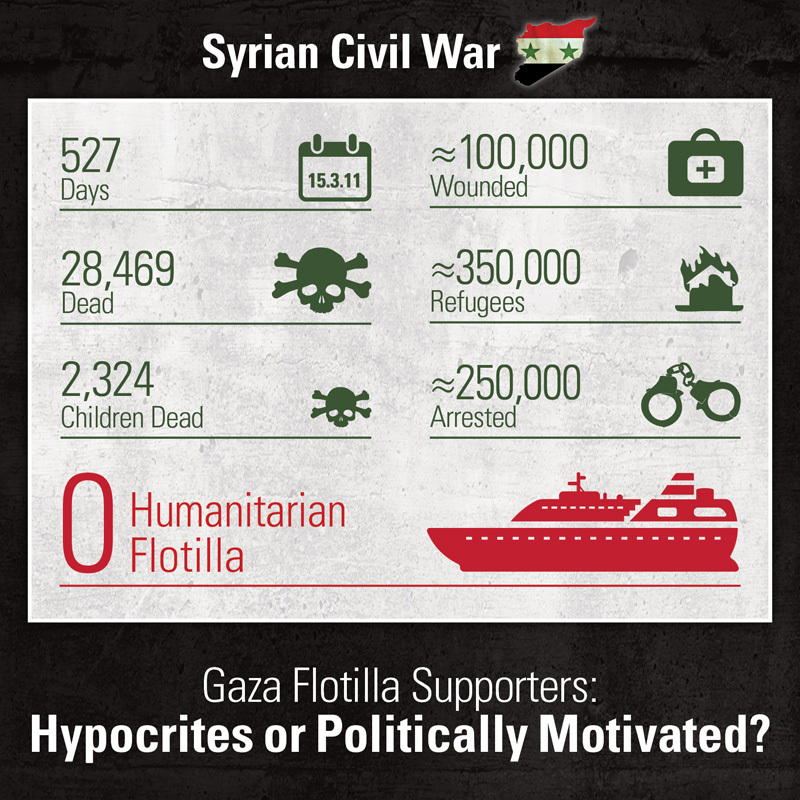 I don’t know who are the people behind the flotilla personally, but I’d love it if you’ll help and spread this Infograph, hoping it’ll reach them. Here is the Image above translated to French, Italian and Spanish. Feel free sharing it but please, link this post to your publication. Does the civil war in Syria mean that the continuous oppression of the Palestinians is now a second-rate issue. If so, does that mean that you are the arbiter of who deserves what and when? And so what if the flottilla was a politcal statement? Do you not think that all wars and outrages in the ME are not, somehow, linked to the politics of the region? I refuse to subscribe to the notion – long held by Israel – that because there are similar or worse humanitarian transgressions in the world, the ones they are committing can be discounted. just wanted to ad that i’m a pro-Israel left of center Jew living in the san francisco bay area. this is the epicenter of anti-Israel activism here on the West Coast but we’re fighting the good fight against these leftist anti-Semites.